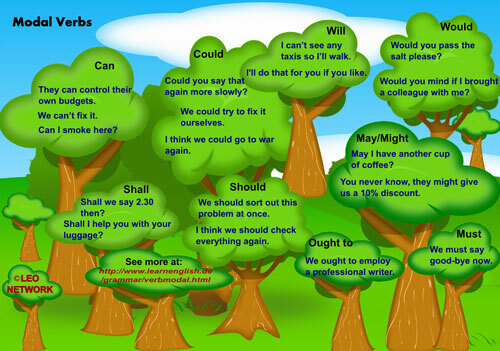 All the auxiliary verbs except be, do and have are called modals. Unlike other auxiliary verbs modals only exist in their helping form; they cannot act alone as the main verb in a sentence. Be, do, and have also differ from the other auxiliaries in that they can also serve as ordinary verbs in a given sentence. Could you say that again more slowly? I think we could go to war again. We'd better phone tomorrow, they might be eating their dinner now. You never know, they might give us a 10% discount. Saying what’s right or correct. You should check your posture when using the computer. I'll do that for you if you like.
! Be careful when using the modal verb "must" when giving advice. You could use "If I were you I would..." instead. !Note - The modal auxiliary verbs are always followed by the base form of the main verb. The verb used to (explained here) can also be used like a modal verb.